Colorado railroads helped shape the state of Colorado, especially Southern Colorado. There are two historic railroads in Southern Colorado that are still in use today. However, there are several other scenic railroads located throughout Colorado. 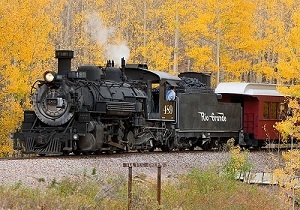 Have you rode on any of Colorado's Scenic Railroads? We, as well as other visitors, would love to hear about your experience. Click here to share about any of Colorado's Railroads. The Rio Grande Scenic Railroad still travels from Alamosa in three of its original four directions. When silver and gold were found in the San Juan Mountains, Alamosa became a major railroad hub almost overnight. There were trains that traveled in and out of Alamosa in all four directions carrying supplies and people. Today you can ride the train east from Alamosa to La Veta, south from Alamosa to Antonito, and west from Alamosa to Monte Vista. The Alamosa to La Veta is the longest and most scenic route. Experience the thrill of riding a steam engine train over steep terrain. This route is also the most frequently traveled. To help keep the excitement up there are several different train options to choose from which can include a round trip dinner train, a train ride with a concert included, and a fun “Rails & Ales Brewfest” which allows you to sample beers from regional breweries. The Alamosa to Antonito and Alamosa to Monte Vista train routes are traveled once a week in the summer. 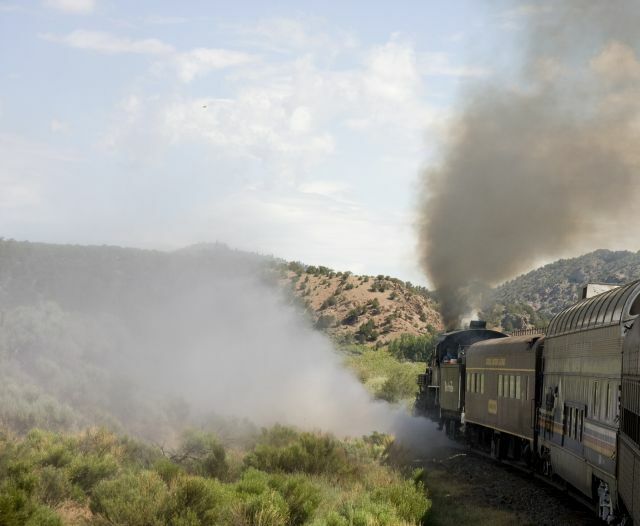 The train to Antonito allows you to connect to the Culbres & Toltec Scenic Railroad which travels into New Mexico. The Monte Vista route allows great views of farmland as well as time to explore downtown Monte Vista. The Cumbres & Toltec Railroad was built in 1880 as part of the San Juan Extension of the Denver & Rio Grande Railroads. The train route was an engineering feat for its time as is travels through steep passes and deep gorges. Today the Cumbres & Toltec Scenic Railroad is the longest and highest narrow gauge train in America. This railroad travels from Antonito, Colorado to Chama, New Mexico. There are several different train options you can take which vary from a round trip ride to Osier, Colorado or travel all the way to Chama and back. Traveling on a Colorado railroad will certainly be an experience you won’t soon forget. I recommend taking time to travel on one or both of these scenic Colorado railroads during your visit to the San Luis Valley. Whichever train you decide will be a great experience that you will never forget! From riding the Cumbres & Toltec Railroad to the Rio Grande Scenic Railroad to any of the other unique railroads across Colorado tell us about your experience. What was your favorite part of the trip? Click here to see the rest of the form and add your railroad adventure! Special thanks to Rio Grande scenic Railroad and Cumbres & Toltec Railroad websites for information and pictures.